not bad for a prot pally -- level 30 is right when prot really becomes an option, and the fast speed will help proc seal of light. Is this supposed to be a reference to a pierced taint? They really do corrupt. Thank god this item is not called Pierced Taint. 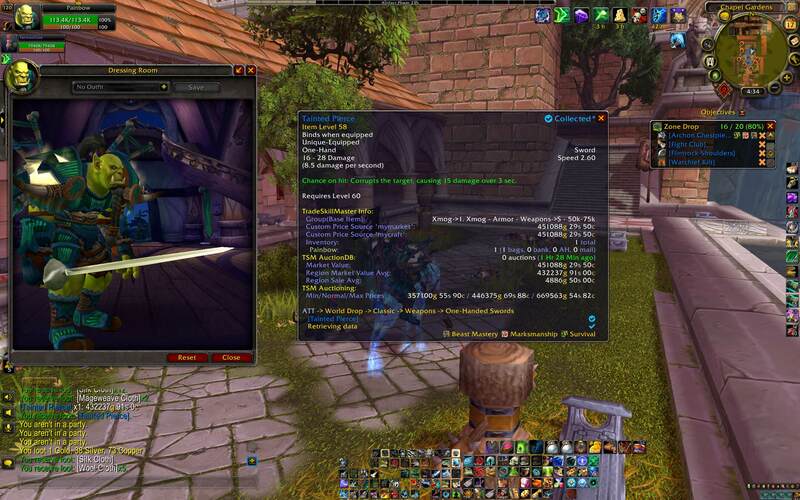 Very nice offhand for fury warriors and rogues, and nice main hand for prot palas due to the high speed. But there are plenty of others sidegrade or improvements for the level; if it drops for you and you can't sell it, if the AH costs become too high, consider having it DEd, since the shard can be valuable. Although Tainted Pierce is pretty cool, I definitely prefer Pierced Taint. With the transmogrification feature being introduced in patch 4.3, this weapon could see a spike in interest due to its skin. Now you can finally raid end-game content as a pirate! Now that Fairbanks is already dead, You cannot obtain this item anymore. EDIT: After I posted this, 2 new mobs were added to the "dropped by" tab. Am I the only one that looked at the item and thought... pierced taint? For transmogging purposes, this seems to be identical to Adamantite Rapier, which is extremely cheap for a blacksmith to make. It seems people think this item is no longer in the game but that's not true. I just had one drop tonight in Scarlet Monastery. If there is any doubt, I happened to have been streaming so I've got both a screenshot and video for you. Here it is. Chance on hit: Corrupts the target, causing 5 damage over 3 sec.